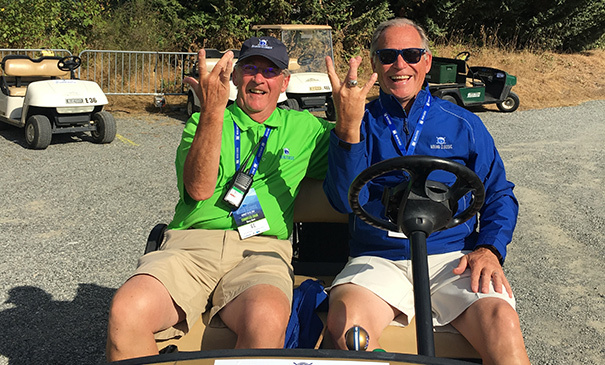 When Gary Kerr’s wife was diagnosed with multiple sclerosis (MS) in 2015, it gave new meaning to his role as co-chair of the volunteers for the Boeing Classic golf tournament. The annual tourney has raised millions of dollars for charities and nonprofits. Its main beneficiary is the Benaroya Research Institute at Virginia Mason (BRI), which is on a mission to improve treatment for autoimmune diseases like MS.
Every year, Gary and the event’s other volunteer co-chair, Tom Bonorden, each spend about 400 hours recruiting and organizing the volunteers who make the tournament a success. Like Gary, Tom’s commitment to the tournament reflects his personal experience: he watched his father and mother struggle with diabetes. Imagining a world without this disease helps him brush off the Boeing Classic’s invariable stresses. One year, a former U.S. Open champion got irritated when Tom recorded the distance of a shot that went off the course. There are joyful moments too – like when Tom and Gary watched a 10-year-old boy birdie the 13th hole to win balls autographed by famed golfer Nick Price.